After preparing my post P is for Portland, I decided that for this week’s Trove Tuesday I would look for any articles about Jacob’s two sons, Peter and Jacob, who moved to South Australia. The first article I found was about the death of Jacob’s son, Laurence John Theisinger. Until I found this article, I didn’t have a date of death yet for Laurence. An inquest touching the death of Laurence John Theisinger on April 16, following injuries received when he was knocked off his bicycle by a taxi will be conducted by the coroner next Tuesday. Lawrence John Theisinger, 49, slinger, of Field street, Whyalla, was killed as the result of a collision while riding his cycle at Whyalla. culpably negligent and should not be sent for trial. 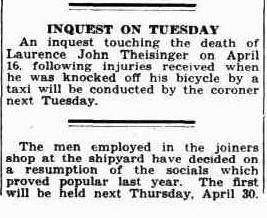 This was the finding of the coroner (Mr. H. Diver) at an inquest on Theisinger. And this article gives more information about where the accident occurred. by James William Duck at the point where McBryde terrace, Whitehead street and Wood Terrace meet. And this article provides even more details. The Coroner, Mr. H. Diver, conducted an inquest on Tuesday, into the circumstances touching the death on April 15 of Laurence John Theisinger from Injuries received in a motor accident on the previous evening. 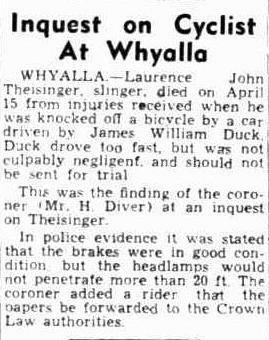 He returned a finding that James William Duck, driver of the motor car which caused the injuries, was travelling too fast, but was not negligent to a degree which amounted to culpable negligence and should not be put upon his trial. Mr. E. W. Palmer appeared for Duck, Mr. W. Beerworth for the relatives of the deceased and Mounted Constable France appeared to assist the Coroner. Clarence Clifford Gibbons deposed that deceased was his father-in-law and lived with him at Field street. Deceased was 49 and was employed as a slingman. It was not his practice to take a light on his bicycle when he was working day shift. When he worked late he would walk home with his bicycle in the darkness. On those occasions when he worked night shift he had an acetylene light. Deceased enjoyed good health arid his eyesight and hearing were good. He did not wear glasses. To the Coroner—Deceased’s time card showed that he knocked off at 6.33 p.m. on the day of the accident. Dr. R. O. Fox stated that he examined Theisinger when he was brought into the hospital. Witness saw signs and symptoms of cerebal hemorrhage. There were lacerations on the right side of the scalp and abrasions on the right forearm, right thigh and a fractured dislocation of the right ankle. Theisinger did not regain consciousness and died next day at midday. The principal cause of death was cerebal hemorrhage. From the injury to the head it appeared that deceased received a severe blow which could have been caused by a fast travelling motor vehicle. To Mr. Beerworth. The whole of the injuries were on the right side of the body. Deceased appeared to be an average healthy man. To Mr. Palmer—The lacerations on the scalp suggested a hit by a sharp object and the abrasions were consistent with having been thrown to the ground. Patrick Clarence Downey, joiner, stated that on the night of the accident he was walking to Whyalla from Geddes & Co.’s mill. When near the intersection of McBryde terrace. Wood terrace and Whitehead street he saw someone approaching on a bicycle. He could not say whether the cyclist was riding or walking. There did not appear to be a light on the bicycle. Almost immediately after he heard a crash behind him. As he stepped on to the footpath he saw the lights of an approaching car which passed where he was standing and came to a standstill about 50 yards past the scene of the accident. He could not say how fast the car was travelling. The driver came back to where the injured man was lying. Witness examined the handle bars but did not see a lamp on them. To Mr. Beerworth—The car light did not illuminate the roadway to any extent. He did not hear any noise of an approaching car and did not hear a warning sounded. Constable C. H. Breuer testified that an examination of the scene of the accident did not disclose any signs of brakes having been applied. Constable A. G. Verner said that Duck reported the accident to him. He was unable to apply the usual test to the brakes as there was no speedometer on the car but his opinion was that they were unusually good and efficient enough to meet the requirements of the Road Traffic Act. When he arrived at the scene the near side head lamp was on. The off side light was out and the glass was broken. There was a dent on the front off-side mudguard and the bumper bar was damaged. The one light did not penetrate more than 20 feet. To Mr. Palmer—Duck said to him that just as he passed the corner of Wood terrace and McBryde terrace and was going over the spoon drain a cyclist appeared to come from nowhere and try to cut across in front of him. He applied his brakes but was too close to avoid hitting the cyclist. There was no light on the bicycle. 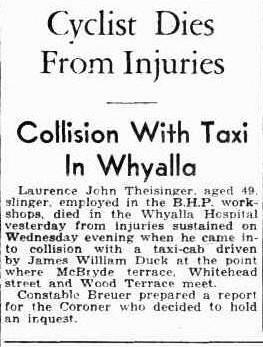 James William Duck stated in evidence that he was driving the car from the blast furnace to Whyalla when the accident occurred. There was a reconditioned engine in the car. This would not permit him to travel faster than 25 miles per hour for the first 500 miles. In delivering his finding the Coroner said—It is my opinion that the driver of the car was negligent in as much as he was travelling much too fast and at a speed which was not safe in the circumstances at that hour of the night and in darkened streets. It is also my opinion that the driver of the car was not keeping as near as practicable to the left side of the road. 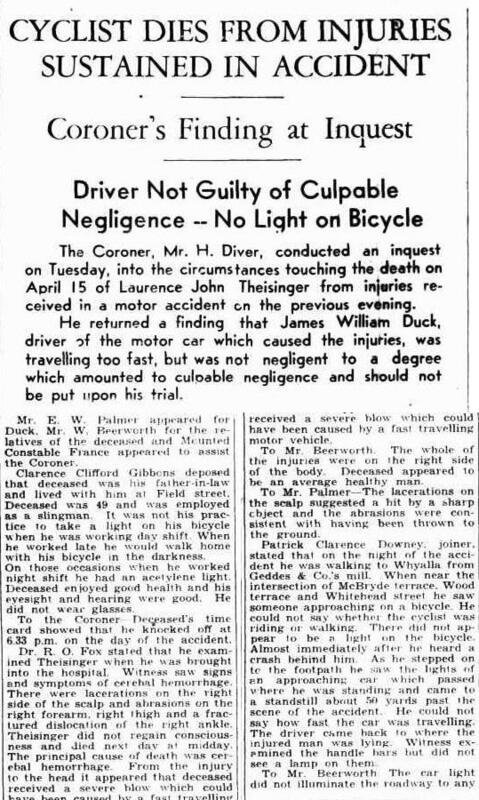 The evidence shows that the deceased did not have a light on his bicycle and this, to some extent may have been a contributory cause of ihe accident. Although I am of the opinion that, the driver of the car was negligent to a degree I do not think that it amounted to culpable negligence and is not sufficient to put him upon trial. The coroner added a rider recommending that the papers be submitted to the Crown Law authorities for any further action they might deem neccessary. I believe this article is also about Laurence John Theisinger, although it only mentions the initials L.J. 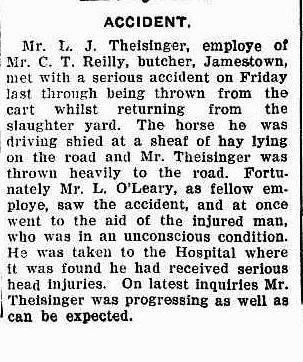 Mr. L. J. Theisinger, employe of Mr. C. T. Reilly, butcher, Jamestown, met with a serious accident on Friday last through being thrown from the cart whilst returning from the slaughter yard. The horse he was driving shied at a sheaf of hay lying on the road and Mr. Theisinger was thrown heavily to the road. Fortunately, Mr. L. O’Leary, as fellow employe, saw the accident, and at once went to the aid of the injured man, who was in an unconscious condition. He was taken to the Hospital where it was found he had received serious head injuries. On latest inquiries Mr. Theisinger was progressing as well as can be expected.